How Long Will Wrist Surgery Recovery Take? If you have been diagnosed with carpal tunnel syndrome and nonsurgical techniques have not helped relieve the pain, your physician might recommend carpal tunnel release surgery. The procedure can be performed by making a small incision and cutting the ligament that is impeding the carpal tunnel. It can also be done by inserting an endoscope (a tiny camera) into a very small incision, which allows the surgeon to cut the ligament with tools inserted into another very small incision. The recovery time for carpal tunnel release surgery depends on whether or not the procedure was done on your dominant hand. In fact, this is true for other types of wrist surgery. If the surgery was performed on your dominant hand, you can expect a recovery time of about four weeks. For the non-dominant hand the recovery time is generally shorter. Because there are many ways that the bones in the wrist can fracture, your recovery time can vary significantly. In general, you can expect a healing period of at least six weeks after a bone fracture. The most common type of bone fracture is the distal radius fracture, which often occurs when trying to catch yourself after a fall. When the fracture is unstable, surgery might be recommended. After surgery, you can expect to wear a fixed splint or cast for at least two weeks, followed by a removable splint for four weeks. Physical therapy starts after about two weeks and continues for at least four to six weeks. 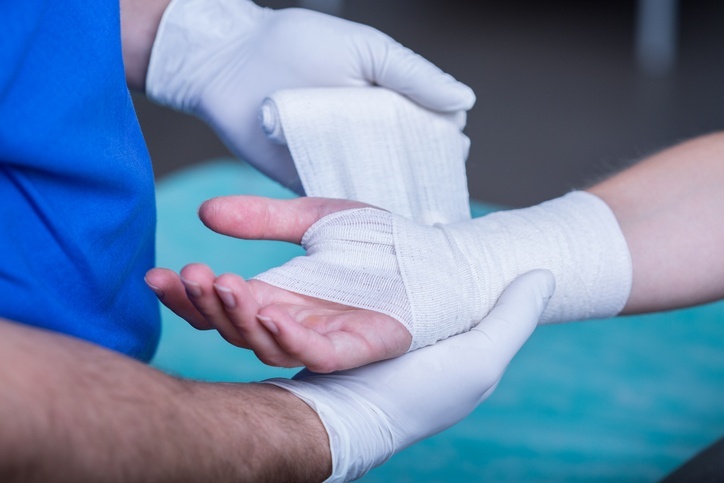 Tendon repair is sometimes recommended for individuals with arthritis or overuse injuries that cause inflammation in the tendons that run along the back of the hand and wrist. Similar to carpal tunnel release surgery, tendon repair can be performed either endoscopically or with an open incision to create more space and relieve pressure on the tendons. Most people recover from this type of surgery in about three to five weeks. You can decrease wrist surgery recovery time by following your physician’s recommendations about limiting activity, resting, and applying cold and compression therapy. After the initial recovery period of a few days to a couple weeks, physical therapy will help you regain range of motion. In general, the earlier you can begin movement the faster you can regain strength and range of motion, but it’s important to ensure that initial healing has taken place first so you don’t damage any repairs that were done. Cold and compression therapy will help limit inflammation, reduce swelling, and naturally relieve pain without the use of medication. This type of therapy is particularly important after surgery because excess inflammation can slow down the healing process. On the other hand, active compression can help accelerate healing by removing excess fluid and bringing fresh blood and nutrients to the healing tissues. For a more convenient and effective way to apply simultaneous cold and compression, ask your doctor about using Game Ready while you recover.